Respiration is a process of release energy. The powerhouses of cells- mitochondria, they break down nutrients(glucose, oxygen) when they go in, and then, create energy(carbon dioxide, water, ATP) for the cell. 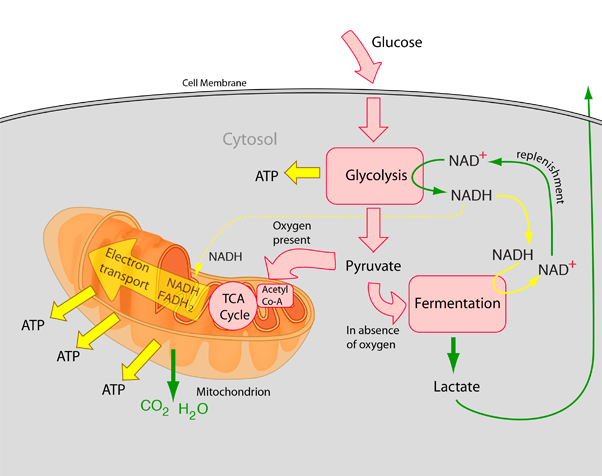 As we can see, respiration happens in mitochondria. Any process in the body that requires energy needs respiration, and we did an experiment which represents the process of respiration. 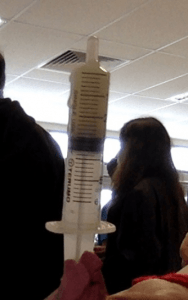 Get a syringe, and put some glucose(already reacted with air, it shows: C6H12O6 + 6O2) in it. Cover it with clay, make sure there won’t be oxygen get in during the experiment. Put syringe into the empty tube straightly with clay in the button. Fill the tube with hot water. Observe what is happening in the tube. Result: There are bubbles coming out after the syringe enter hot water, the volume of things inside the syringe increase from 3 to 4. Conclusion: Those bubbles contain gas, which is carbon dioxide. The number changed because there’s water inside the syringe. The experience shows us, C6H12O6 + 6O2→ 6CO2 + 6H2O.